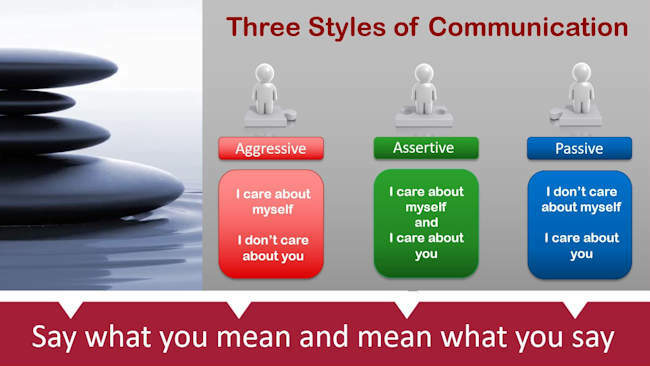 You can communicate more effectively by being assertive, but not aggressive! A good understanding of the three primary styles of communication will help you learn how to react most effectively when confronted with a difficult person. Perhaps, more importantly, it will assist you in recognising when you are not being assertive or not behaving in the most effective way! Remember, whilst you always have a choice as to which communication style you use, being assertive is usually the most effective, but other styles are necessary for certain situations. Learning to identify the different communication styles and recognising which one you ordinarily use in your daily interactions with colleagues and employees is essential when you need to develop effective, assertive communication skills. Being assertive is where you have respect for both yourself and other people. It is seen as the ability to clearly express your thoughts and feelings through open, honest and direct communication; to be clear, direct, and respectful in how you communicate. Being passive is where you care more about other people and are not an advocate for yourself and your own feelings. If you’re serious about strengthening your relationships, reducing stress from conflict and decreasing unnecessary anxiety in your business, you must practice being more assertive. As a business owner, you must be confident in who you are, what you stand for and then present your views without fear and with respect for others. In business, assertiveness is a key to better and quicker decision making, and faster and more productive actions. In time, this will breed a culture of assertiveness where more ideas can be generated leading to higher productivity and profitability. Employees who are assertive thrive in the workplace, especially if the situations are ambiguous. They are able to stand up for themselves in a way that doesn’t hurt others feelings. They are transparent in their interaction with their work colleagues and are clear and honest in their communication. They also generate results by controlling their immediate environment in a very positive manner. Assertive people are also very self-assured, which means that they effortlessly gain the respect of people they work with. Remember the first rule of effective communication: the sender of the message much check that the receiver actually heard and understood what was said. To learn more about communication styles and how you can communicate more effectively, give me a call on 01280 700405 or click here to ping me an email and let’s see how I can help you. Do you want to achieve your strategy? Strategic intent is the difference between achieving your goals and never finding success! STRATEGY: The first confusion is the difference between strategy and tactics. All too often, business people call everything they are doing in order to achieve their goals their strategy, in fact, most of these activities are tactics. Your strategy is your driving goal, whereas tactics are the right things that you will do in order to turn your goal into reality and will always connect to your companies driving purpose and mission. INTENT: This is nothing more than driving a goal, purpose or passion that you are motivated to achieve at a level of excellence. You will not only be responsible for identifying the correct things that will assist you to execute on a plan, you are also accountable for identifying the right things that will enable you to excel. How can I be sure that I will achieve the greatest positive results? Have I taken time to define a good solid strategy? How do I ensure that I am focussing on the right tactics to achieve the strategy? Is what I am doing right now on the right track for me to achieve my strategic intent? Do I really “Intend” to achieve these goals? Is my Business Strategic Intent aligned and in correlation with to my personal strategic intent? Do I have the correct Planning, People, Processes and Positioning in place? When you are absolutely certain that you have identified your strategic intent, you will then be ready to begin to discover whether you are doing the right things to support that intent. Use a reflection model to regularly evaluate what you are doing and how that is supporting your strategic intent, make changes accordingly. Some people achieve extraordinary things in life, others don’t and struggle through life never quite finding success. The difference between the two is the lack of strategic intent and a lack of accountability. 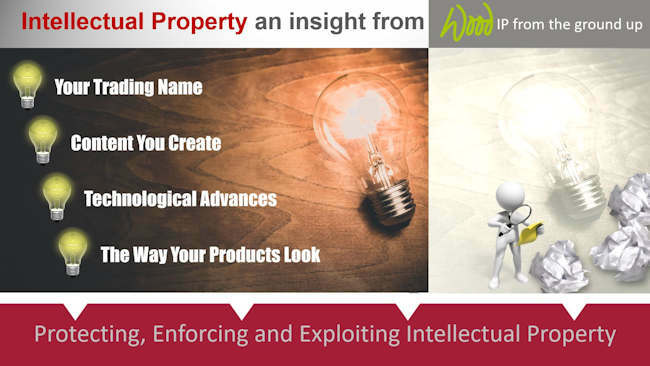 To find out more about upping your level of strategic intent, do call me on 01280 700405 or click here to ping me an email and let’s see how I can help you. Or do you take a scattergun approach? 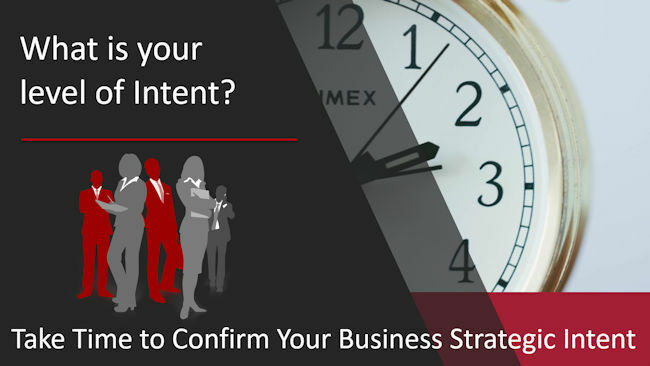 Take time to plan your marketing strategy. It’ll pay dividends in the end! It’s scary when I find they operate from a knee-jerk reaction when they feel they need to attract more clients. It’s even scarier that many businesses owners have never taken the time to identify their target market. Then there is the little spoken about ROI (Return on Investment) or, as I prefer to say, ROE (Return on Engagement) with little, if any, reflection and evaluation. Without marketing, you would have very few potential clients to follow up, and without a sound sales technique and strategy your conversion rate could leave you wondering where to get the next client. If we broke it down to the basics, marketing is everything that you do to reach and persuade prospects, and sales is everything that you do to close the deal and get a signed agreement or contract. If you work to strategically combine both efforts, you will experience a successful amount of business growth. What does your target client look like and where are they? How do you intend to communicate with your potential clients? Through what media and channels will you communicate? Do you have sufficient resources to implement the marketing strategy? Do you have the processes in place to evaluate the results? Are your salespeople sufficiently competent in converting prospect into clients? How much have you allocated in your budget for marketing? And is this sufficient? The beauty of approaching marketing strategy methodically is that you can always retrace your steps when evaluating success or failure of specific tactics, or finding ways to improve on your initial objectives. At 4P Business Development we call all this positioning. Positioning helps establish your business identity and the reason for being then positions your business in the most motivating and competitive manner within the marketplace. In order to create a positioning strategy, we help identify your businesses uniqueness, then determine what differentiates you from your competition. To do this we help you immerse yourself in the eyes of your target audience, the marketplace and the decision making steps take. We go through a positioning process which helps identify your target audience, your USP, your companies or brands differentiation vs. competitors, customer satisfaction, product uniqueness, believability and ownability, and the longevity of the proposed positioning. We work with you to create your positioning statement and offer advice on how to immerse employees in the business so that everyone is familiar, engaged and lives and breathes your businesses positioning. To find out more about creating your own marketing strategy, and learn how to grow your business by reaching your target market, call me on 01280 700405 or click here to ping me an email and let’s see how I can help you. Reflection is all about careful and considerate thought! The practice of reflection is about reflecting on what you do or what has happened. It is closely linked to the concept of learning from experience, in that you think about what you did, and what the results were, and decide from that what you would do differently next time. But the kind of reflection that is really valuable to leaders is more than that; the most useful reflection involves the conscious consideration and analysis of beliefs and actions for the purpose of learning. Reflection allows your brain an opportunity to pause amidst the chaos, untangle and sort through observations and experiences, consider multiple possible interpretations, and create meaning. This meaning becomes learning, which can then assist you in making informed decisions about future mindsets and actions. Select a reflection process that matches your preferences. Many people reflect through writing in a journal. If that sounds terrible but talking with a colleague sounds better, consider that. As long as you’re reflecting and not just chatting about the latest sporting event or complaining about a colleague, your approach is up to you. You can sit, walk, bike, or stand, alone or with a partner, writing, talking, or thinking. Start small. If an hour of reflection seems like too much, try 10 minutes. Many leaders found that the most significant driver of positive emotions and motivation at work was making progress on the tasks at hand. Set yourself up to make progress, even if it feels small. Do it. Go back to your list of questions and explore them. Be still. Think. Consider multiple perspectives. Look at the opposite of what you initially believe. Brainstorm. You don’t have to like or agree with all of your thoughts – just think and to examine your thinking. To find out more about reflection and to learn how to reflect on critical incidents and events on a regular basis, so that it becomes integral to your thinking call me on 01280 700405 or click here to ping me an email and let’s see how I can help you.